"IN THE PREMORTAL REALM, spirit sons and daughters knew and worshipped God as their Eternal Father and accepted His plan by which His children could obtain a physical body and gain earthly experience to progress toward perfection and ultimately realize their divine destiny as heirs of eternal life. 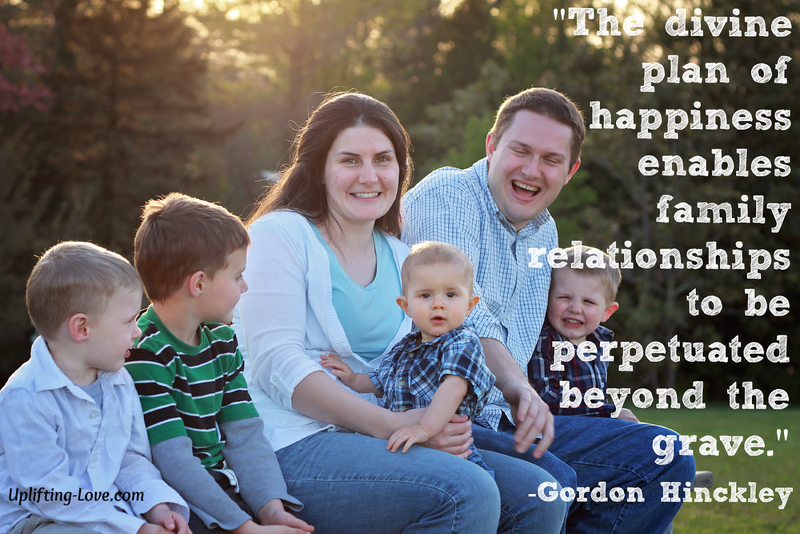 The divine plan of happiness enables family relationships to be perpetuated beyond the grave. Sacred ordinances and covenants available in holy temples make it possible for individuals to return to the presence of God and for families to be united eternally." I have always cringed when I have heard the phrase "Until death do you part." I know that I am a bit of a romantic and always have been. I think it's my parent's fault because they have always been so happy together. Yes they have had their rough patches but by and large they always loved and respected one another and continue to do so today. They don't talk about an end to their marriage and never have. Why would anyone want to marry a person they are madly in love with, the person that they want to spend their entire life with, planning to leave them when one of them dies. If we were meant to be that way then wouldn't the pain of losing a spouse be easier? Once their dead you should be freed from those feelings of love, admiration, respect, longing, and desire for their companionship. Yet, I am told, they persist. Generally for the rest of your life. One of my parent's friends when I was a teenager, we'll call him Larry, spoke to a youth group at our church one time and talked about his first marriage. He and his first wife had fallen deeply in love and desired to marry. During one of the sessions of their pre-marriage counseling with their pastor they reviewed the language in the ceremony, including the "until death do you part" verbiage. At this point the groom-to-be, Larry, stopped him and asked that he leave that part of the ceremony out or replace it with "forever". The pastor resisted doing so because, as he explained to them, he did not have the authority to bind a marriage past the grave. This really frustrated the young couple because they wanted to be together forever. Many years later, after their children were grown, Larry's wife was diagnosed with cancer. They fought it as best they could but eventually she passed away. He was racked with grief and relied on his faith to help him through the trial. The deep love he had for her did not diminish after she passed away. He eventually met another woman, they fell in love, and were married. However, Larry told me that he still profoundly loved his first wife. I have heard similar declarations from others, both men and women, who have lost their spouse. So I ask, why would God imbue us with the ability to develop the soul penetrating emotional connections that form between husband and wife and allow them to continue after we die if we death created a barrier between us or, at the very least, dissolved our union? While I've never seen beyond the grave I believe with all of my heart that I am supposed to be with my beloved wife forever, not just until one of us dies. That is the a key component to the foundation of our marriage. We are building a marriage that will last forever, not just for the next forty or fifty years. This gives us perspective on the problems we face and the frustrations with each other that we feel. It plays a big role in the happiness we enjoy. God, as our loving Heavenly Father, designed this life to test us and give us opportunities to learn and progress and He wants us to be happy. 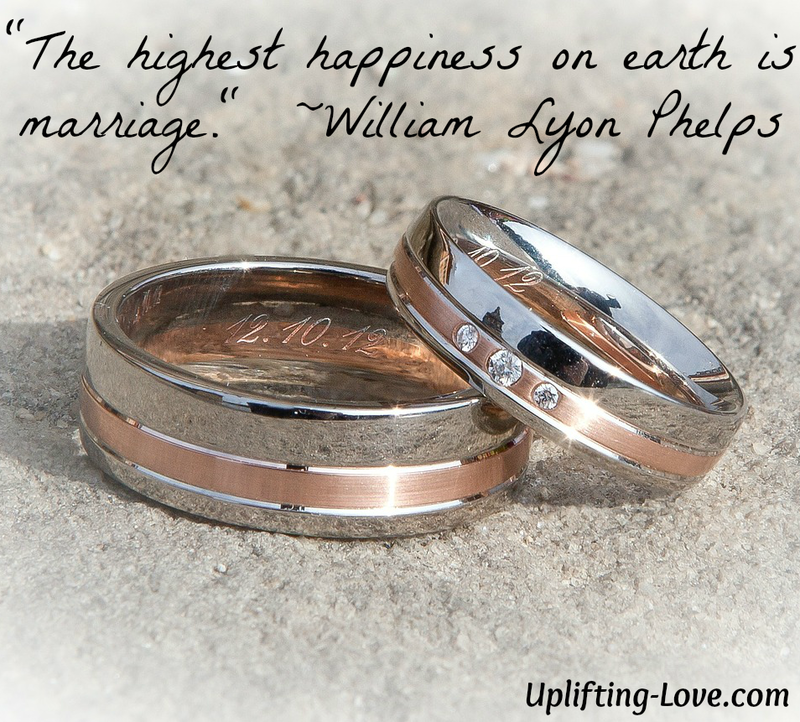 He instituted marriage and families so that we could achieve the greatest happiness possible. My marriage isn't "until death do us part." My marriage is forever. Stopping by from Capture Your Journey! That's right! Thanks for stopping by!